Love makes you feel like you are on top of the world, but trust me, there is nothing like actually being on top of the world with your love. The high elevation can literally take your breath away and to enjoy the view with your loved ones is something special. This is the view from nearly 11,000 feet, on the Beartooth Highway in the Beartooth mountain range looking out over the Absaroka mountain range just across the Montana border in Wyoming. Fitting for a wedding, the wedding cake shaped peak on the right is Pilot Peak, which sits at 11,699 feet (see more about Pilot peak here). See more from Kristen and Jake’s epic wedding here. It is almost magical to sit on the top of one mountain range and see another mountain range at eye level. Most people rarely, if ever, get to look a mountain in the eye, but that’s one of the perks of living so close to the national treasure that is the Beartooth Highway 212 in Southern Montana and Northern Wyoming. This location is only about a two hour drive from downtown Billings Montana and only about 30 minutes from Red Lodge Montana. And this is the view right on the highway at one of the many scenic pullouts. It makes for an outstanding afternoon drive for engagement photos, honeymoon photos, or even just a joy ride with the dogs, as my wife and I often do. 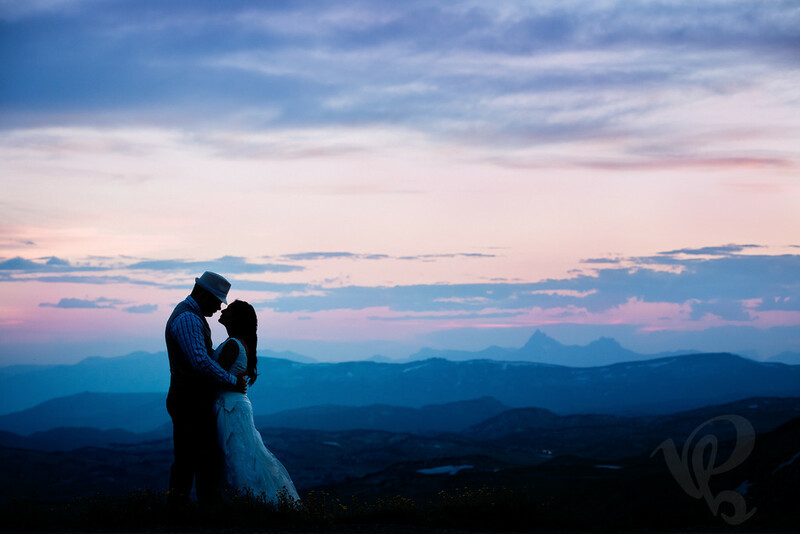 In this case, Kristen and Jake were taking a mini-honeymoon in the Red Lodge area after their wedding, and decided to go exploring the Beartooth Pass with their wedding photographer. This type of session is called a “day after” session, or a “honeymoon” session and it is included in my most popular wedding collection. This session includes worldwide travel so that my clients can make the most of their honeymoon travel by having an exclusive shoot with their wedding photographer in an exotic destination. So far this year we’ve been to Vancouver, Maui, Yellowstone, Glacier, the Beartooth mountains, and many more places around Montana. This upcoming year we already have trips on the calendar for Western Europe, Fiji, Disney World and Phoenix. I love to travel and photograph weddings in any destination worldwide. Beyond allowing us to go to amazing locations with the beautiful bride and her wedding dress, the honeymoon session is also great for a couple of practical reasons. First, it gives us more time to make creative portraits of the bride and groom alone. Having extra time is nice because these are usually the most important portraits that will be printed and hanging as artwork in your home, so the extra time and lack of wedding day chaos enables us to make something amazing. Second, it frees up the wedding day so that the timeline is more flexible and you can spend more time with your guests. This is huge! Some of your wedding guests have traveled far to spend time with you, and you don’t want your photographer to take up too much time on your wedding day. At the same time, these are going to be your favorite portraits and you want to give your photographer enough time to work their magic. The honeymoon session solves both problems, relieving a source of stress on the wedding day, and ensuring you receive family heirloom quality images that will be printed and hang as artwork in your home. I highly recommend asking about a day after session before booking your wedding photographer.